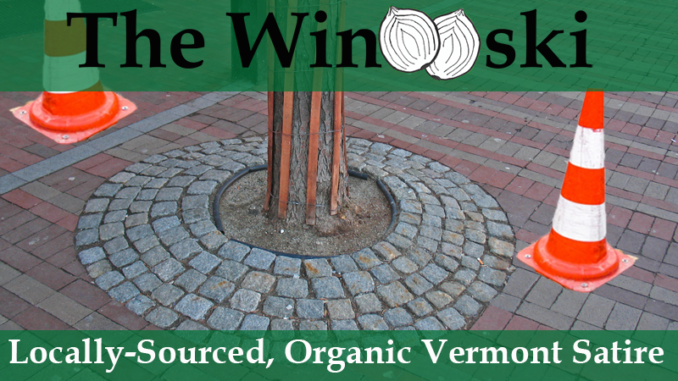 BURLINGTON – The Committee to Protest the Sky is Blue (CPSB) has started a full-on campaign to stop the proposal to place two orange traffic cones in the middle of Church Street between Main and College. The protest began after the Department of Public Works sent an e-mail to Church Street merchants informing them that two traffic cones would be place in the middle of the street to block off a three-foot area where a pot hole has developed. The CPSB discovered this because it sends daily freedom of information request notices to all city agencies regarding any and all plans that impact anything. The CPSB immediately launched into action. It started a Facebook campaign, hired a lawyer, received funding from an anonymous source, sent notices via Front Porch Forum, and began a petition drive. DPW responded by acknowledging the concern. However, it indicated that engineers, architects, and members of the Church Street Marketplace had met fifteen times on the matter and decided that the cones were necessary. Given the protest, DPW agreed to hold public meetings in all wards to explain the two-week project. Stay tuned for updates in this developing story. It is sure to rank in importance with other City boondoggles such as the 80-story mall; the 30,000-seat arena at Memorial Auditorium; the south end super highway and the clear cutting of City Hall Park. Plus, orange is the color of our Emperor-God.